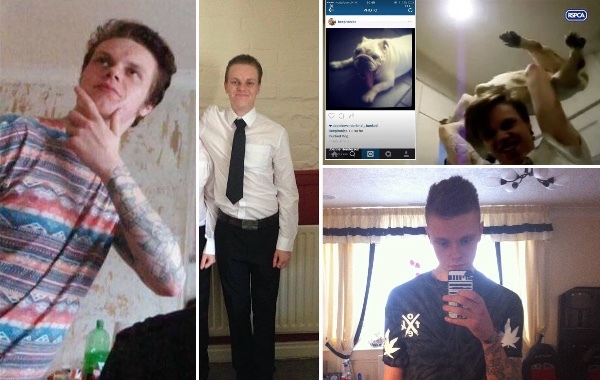 Following the sentencing of Andrew and Daniel Frankish for animal cruelty charges against their pet Bulldog "Baby", and the current relative success of the petition to have their woeful sentence of 21 weeks suspended sentence reconsidered, I would like to fund raise for the RSPCA Middlesborough and South Tees (Charity no. 232226) due to their involvement in this harrowing case. This way, if nothing ends up coming of the petition and their sentencing remains the same, some good has been achieved from the passing of the poor Baby. The donations will be tallied up once it has hit its target and paid by cheque, as requested by the RSPCA after speaking to them. They will then send a receipt, along with a list explaining exactly how the money will be spent, which I will then send out to everybody via a petition update. I have confirmed that all funds will go to the animals in need, and not to the organisation staff. Many thanks for all of your kind donations, let's make it count everyone! I have now pulled the fundraising side of the campaign at a fantastic £3,686. 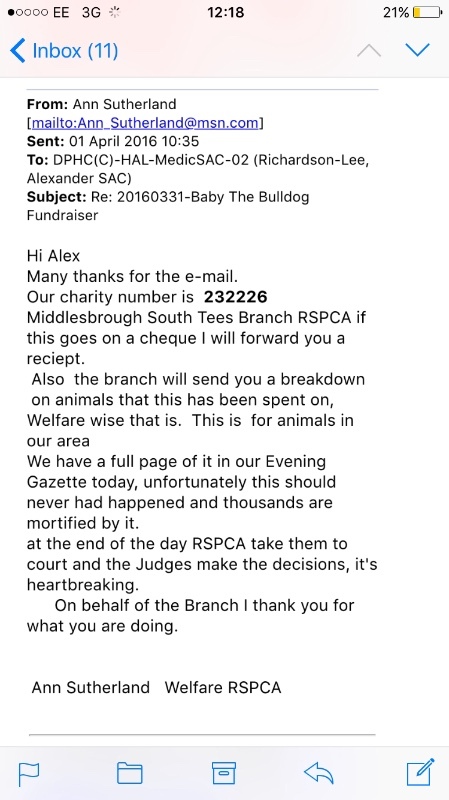 Thank you to all donors for your generosity, and while Stripe (the company that is used by GoFundMe to deal with the money) is transferring the money little by little, I am putting it to one side to send in as a cheque to the RSPCA Middlesbrough and South Tees branch as discussed with them. The reason for me pulling the campaign is that Stripe, unbeknown to me, takes an approximate cut of 8.52%. This has annoyed me beyond belief as it was not made clear when setting up the fundraiser that that was the case. This means a deduction of £314.05 has been made by a greedy company, leaving £3,371.95. Because this is partially my error, and partially them hiding these facts in the smallest print possible, I will be donating £128.05 of my own money to the cause as well, giving us a grand total of £3500. It is the best I can do in my personal circumstances, and I cannot afford to make the entire lot up myself, frustratingly. But this is why I have taken the campaign offline now, rather than later on. I apologise sincerely for my administrative error with regards to setting up the account, however you have all been incredible, and I can't thank you enough. When the money has finished clearing (they do it daily, so will take up to a fortnight I imagine for all funds to hit my bank) I will be sending the cheque out myself, and will keep everybody updated via the Change.org page. 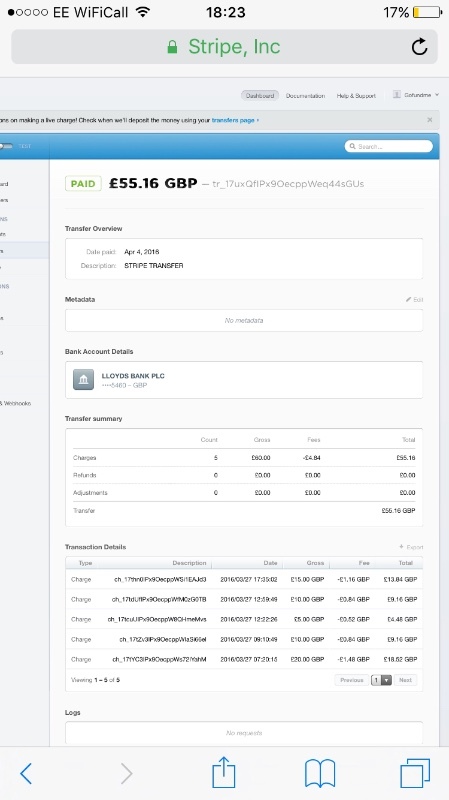 Please see the attached screenshot of the latest bank transfer made to me, to prove that it is Stripe taking a cut out of each transfer. I'm going to start on a positive note! We're so close to the target of £3,000 to go directly to the RSPCA Middlesbrough and South Tees branch, and that's crazy that there are so many beautiful, generous people about, so thank you for that! However, it is a shame that there are a few people that cannot understand what I am trying to do here, and are insistent on bringing this down. As I have said before, and I will say again, the reason i have set up the fundraiser off my own back is because I want the money to go directly to the animals. If you donate to the general RSPCA fund a cut goes to the administrative staff, and it goes through HQ. Having spoken to the RSPCA Branch in question yesterday, they prefer the donation to come by cheque. I will be backing this up by email later today/tomorrow with a screenshot as an update on the petition page. Please people, this is a chance for some good to come from an awful situation - if you are dubious of the campaign or anything else, get in touch with me directly. Please also see the screenshot of the email I sent to the advertised local RSPCA branch, which I need to forward on to the individual that deals with the donations. Hi Treeny Pops, thanks for your comment. Unfortunately it does not let me reply directly. As far as I am aware, GoFundMe will not take a percentage of the donations made. All proceeds will be going to the charity. 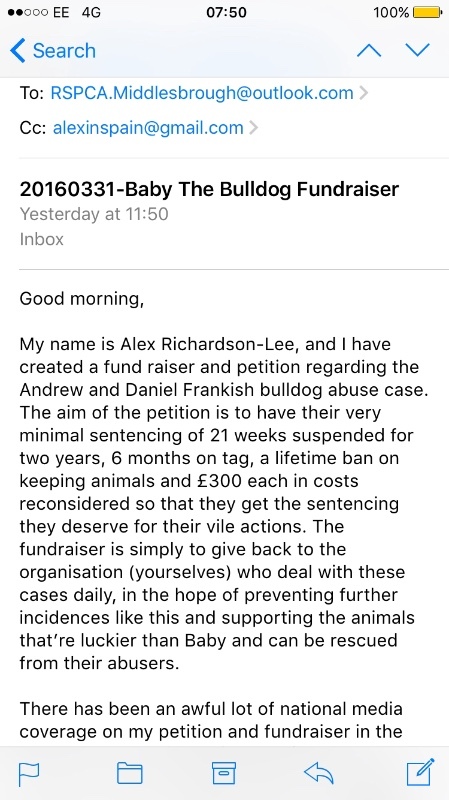 The reason for this fundraiser is to give a little back to the organisation involved daily with cases such as Baby the bulldog. Hopefully the petition will have an effect on the two offenders' sentencing, but should it fail, at least something can be then donated to try and help prevent these things from happening, and supporting the animals rescued from people like this. Please, anyone concerned about the petition, the fund raiser, or anything else, message me directly with a contact number and a suitable time to call, and I am more than happy to ring you directly and discuss any queries you may have. Failing that, I'm more than happy to talk by email or Facebook messenger! Change.org appears to be down at the moment, but this has gone stratospheric, especially after appearing in various national and international newspapers. I will post a proper update tomorrow on the petition page, however I can't thank everybody involved enough! I hope this pair of sick thick and cruel sadists, get what is coming to them. As for Baby the dog, may she be in a better place than this world which seems to have an ever increasing amount of cruel people in it. You never deserved such treatment sweet dog, and I would happily have given you a home and respected, loved and cared for you so much. No one can take back what happened to you, but we can and will get back at your abusers, and we can make sure that they are properly sentenced this time. I am ashamed to be part of the human race. Sleep peacefully free from pain, suffering and fear gorgeous girl. Do we know their facebooks or anything?? So people can know where these sickos live and they can get what they deserve?? Does anyone know them personally? It pains me to say this, but I feel that the RSPCA have not stepped up to the mark with this issue. I am not donating. IF you look at the Animal Welfare Act 2006 there are more than 20 pieces of legislation which lead to a complete overhaul of pet abuse laws. Under the Act, it is not only against the law to be cruel to an animal, but it places a duty on animal owners to ensure that their welfare needs are met. Further more IF the RSPCA had asked the court to use the FULL force of the AWA 2006, the following process could have been followed. If you are convicted of an offence under the Act, you may have your animals taken away from you or be banned from keeping animals, or both; fined up to £20,000 or sent to prison for a maximum term of 51 weeks. So WHY were the Frankish brothers not locked up for 51 Weeks ?? Or fined the max £20,000 ?. ..If I was the RSPCA I would start investing in a proper legal team and a top barrister to fight these cases. Prison is too good for filth like them, they should be made to suffer the same treatment as that poor dog. I felt physically sick when I read about these sadists and their torment of baby. animals give us such love unconditionally that for anyone to abuse them like this shows the evil in their hearts. I hope these two are haunted for the rest of their lives , sleeping and waking , by their act of unspeakable cruelty , and if there is a world beyond this one , that they are made to answer for their crimes. 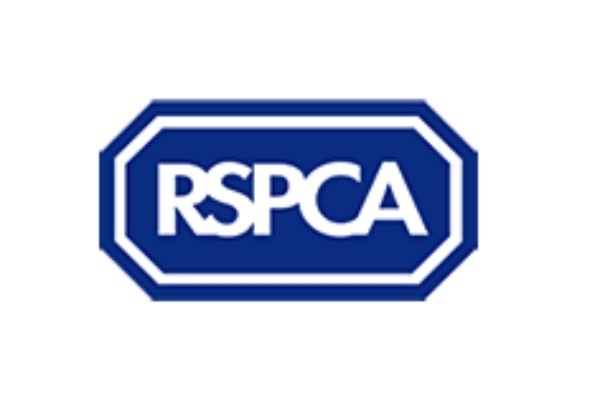 If you want to donate to the RSPCA donate at rspca.org.uk/getinvolved/donate dont donate funds to some random person's Gofundme. I'm totally heartbroken! They should be made to clean out dog mess at the centre where baby was taken every day for six month S karma always comes round in the end!! I'm all for the petition and raising the profile of these two evil people - but the RSPCA are not an organisation worth donating to. They have £millions in the bank - where are their campaigns against animal cruelty, puppy farming and intensive farming? If you're going to donate, donate to a small local charity where your money will make far more of a difference. Hi, is there are any possibility to pay via paypal? Unfortunately I haven't a credit card. Sick people! I wish for you the worse that life can reserve for you ! Go to hell!!!!! Idiots!!!!! Are there any other links to follow up on this story as the posts on here are from 9 months ago and is there anywhere showing the money was actually donated? Has anything progressed with this petition, has any further action been taken to have their sentences commuted to something more in line with these two monsters horrible actions? They can count themselves blessed that the do not live close to me. They would rue the day that their video came to my timeline. Just saying. Money to the RSPCA? You might as well burn it because they're only going to waste it on their own agenda. Thank you Alex for taking the time to make this all happen .Such a shame you had to do this. There are some wicked people in this world but as your petition and fundraising shows there are a great many good people too. My thoughts and prayers are with Baby. What happened to the poor creature was so cruel and abhorrent. Well done on all the hard work you are doing Alex. Gregg.